As we highlighted in our Get Ready for Launch update in March, the then expected Q2/Q3 New York listing was announced on Friday through an F-1. 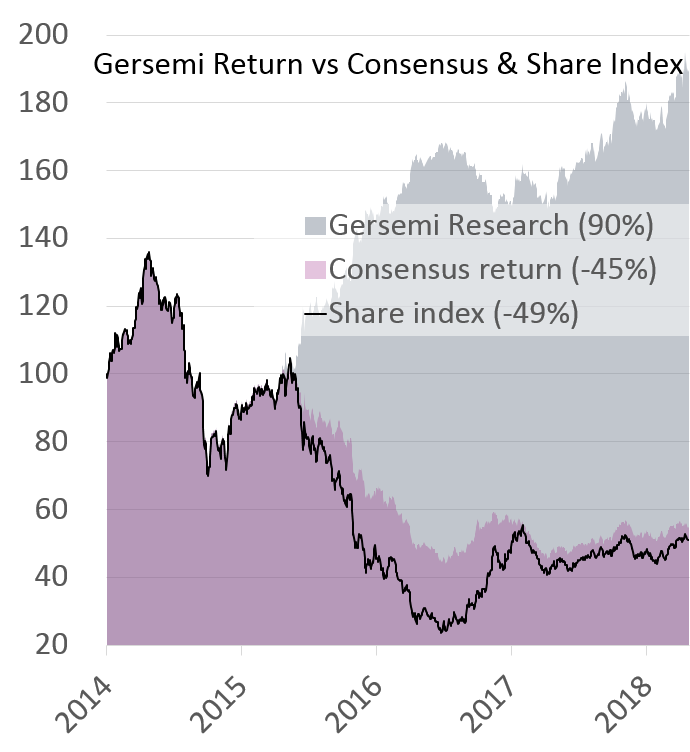 Assuming a 5% discount to our current NAV, we forecast 8m new shares to be issued around $15.8/sh (NOK 129), representing 21% of outstanding shares in the NewCo. We reiterated our BUY rating and TP of NOK 212 ($26). IPO guidance: Although the IPO has not been concluded and no pricing indications have been given, the F-1 includes information which in combination with our calculations enables us to provide a guidance on the fair outcome of the IPO. An update will be provided to our Private Network when the deal is concluded, expected at latest in early July. 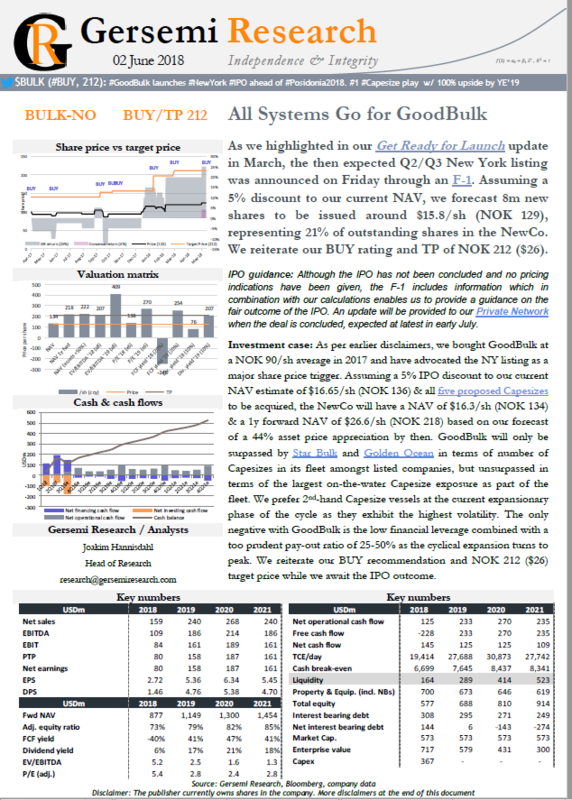 Investment case: As per earlier disclaimers, we bought GoodBulk at a NOK 90/sh average in 2017 and have advocated the NY listing as a major share price trigger. Assuming a 5% IPO discount to our current NAV estimate of $16.65/sh (NOK 136) & all five proposed Capesizes to be acquired, the NewCo will have a NAV of $16.3/sh (NOK 134) & a 1y forward NAV of $26.6/sh (NOK 218) based on our forecast of a 44% asset price appreciation by then. GoodBulk will only be surpassed by Star Bulk and Golden Ocean in terms of number of Capesizes in its fleet amongst listed companies, but unsurpassed in terms of the largest on-the-water Capesize exposure as part of the fleet. We prefer 2nd-hand Capesize vessels at the current expansionary phase of the cycle as they exhibit the highest volatility. The only negative with GoodBulk is the low financial leverage combined with a too prudent pay-out ratio of 25-50% as the cyclical expansion turns to peak. We reiterate our BUY recommendation and NOK 212 ($26) target price while we await the IPO outcome. This entry was posted in _Public, dry bulk, shipping and tagged BULK, bulk-no, GBLK-US, glbk, GoodBulk. Bookmark the permalink.